Conehead Thyme grows slowly into a two foot wide mound that eventually reaches one to three feet in height. When it blooms, it is completely covered with incredibly spicy purple blossoms. Garnish salsa verde or guacamole with the hot little flowers of Conehead Thyme. Or, add the flowers with other chopped herbs like Basil and add to salad dressings. The leaves are also quite hot and are traditionally used as a component in the Middle Eastern spice blend called Zatar. This blend can also include Pink Savory and Syrian Oregano. 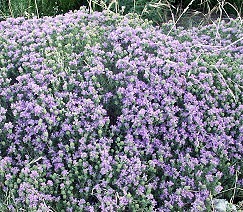 You can see why the word thyme is associated with this plant. Look at those little needles which are definitely reminiscent of English Thyme. And, the flavor is like thyme with the heat turned up. 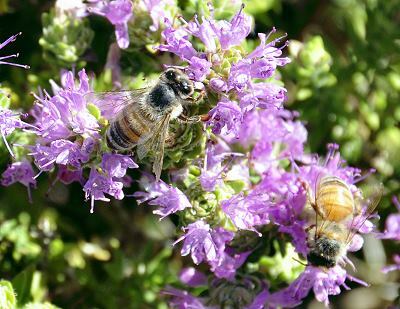 Plus, like thyme, Conehead Thyme is extremely attractive to bees. They know what's good! 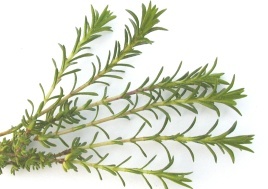 Conehead Thyme is one of the six plants chosen to be in our Edible Flower Herb Garden. This plant is sometimes available in plug trays. These trays hold 128 of all the same plant. They are a great low cost way to fill a lot of space. Each cell is 3/4 of inch by an inch. Check here to see if Conehead Plug Trays are available.